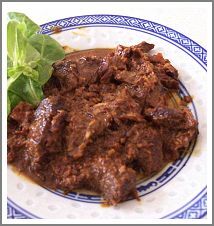 Beef Rendang is a healthy and delicious Indonesian food. Why is this dish such a healthy food? This meat dish contains beef and coconut milk which have a great value to your health. Beef is an excellent source of protein, zinc, vitamin B12 (the important vitamin which you can't find in any vegetables or fruits), Iron, Niacin, Vitamin B6, and Phosphorus. And above of all, this Indonesian recipe contains coconut milk which is very high in nutrient benefits. Find out how coconut milk can do for your body in another page. Beside the health benefits, this dish has certainly a great taste which is lovable by anyone and it's not difficult to make but it takes a few hours to cook before its ready to get tender meat. If you haven't any time to cook that long to stir this dish once a while, use microcomputer rice steamer. It's easy to use. What you have to do is put all ingredients together including the coconut milk and the meat in the rice steamer and push the button slow cook, and three hours later you will get delicious beef rendang without any trouble. Click here for further instructions. In the meantime you can do other things such as cleaning your house, going to the supermarket without to worry that your dish will getting burn. Make a smooth paste of Garlic, Onion, Chili peppers, and turmeric powder. Heat 2 table spoon oil in the pan, add the mixture, stir it until fragrant. Add the beef, galangal, ginger and bay leaves, lower the heat and let it simmer with the lid for 1/2 hour until the juice comes out of the beef. Add the coconut milk, bouillon powder, salt, sweet soya sauce and sugar, and add some water if the coconut milk is too thick. Served hot with white rice. Looking for a quality beef, but you have no time to search the entire supermarket or go to the quality butcher? You're only one click away to get health and low calorie beef and that's not all, you don't have to go away from home, Get gourmet beef sent right to your door!